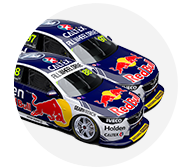 Triple Eight team-mates Jamie Whincup and Craig Lowndes backed up their one-two finish from the Symmons Plains opener by topping final Supercars practice on Sunday morning. The 20-minute session took place in dry conditions, despite a sprinkling of rain in the preceding Dunlop Super2 race and threatening skies. Under the new ARMOR ALL Qualifying format, Practice 4 took on extra importance, with the top 10 gaining a free pass to Q2. Fast times went down from the outset, Whincup recording a 50.8060s in the opening minutes to lead the way for most of the running. Lowndes went 0.1746 seconds faster with just under three minutes to go, before Whincup responded with a 50.6904s that proved unbeatable. 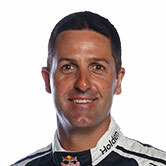 Again happy with his Autobarn Holden, Lowndes noted that the weather is a major unknown for the afternoon. “It’s cooler, so it takes two laps, three laps for the tyre temp to come up,” he said. “Luckily at the moment it’s still dry. The forecast from our gurus says that’s the worst of it, hopefully it now blows away and we have a dry day. Scott McLaughlin was third, doing a 10-lap race run before turning his attention to qualifying speed in the final minutes. The Shell team had undertaken a precautionary gearbox change overnight, as well as replacing a number of electrical sensors, following trouble in Saturday’s race. Jack Le Brocq, David Reynolds, James Courtney, Garth Tander, Shane van Gisbergen, Fabian Coulthard and Rick Kelly will also skip Q1 after filling the top 10. The final minutes had been typically frantic, with the composition of the top 10 changing rapidly. Even Saturday polesitter van Gisbergen looked likely to miss out on the 10 with a minute remaining, before securing his place with a final lap. Reynolds, second in the championship behind van Gisbergen, was too bumped in the closing stages before scrapping in – recording his time with just four seconds left. “We’ve made some changes overnight to get some more turn at the hairpin, I was losing a bit there yesterday, to really have a go at passing more cars,” said Reynolds. All four Tickford Falcons again missed out, with Cameron Waters the best of the four-car squad in 11th. Mark Winterbottom wound up 16th with Chaz Mostert 21st and Richie Stanaway at the foot of the order. Le Brocq was again head and shoulders above the next rookie, which proved to be Todd Hazelwood in 19th. “The car’s feeling quite good, just building up confidence from yesterday,” said Le Brocq. ARMOR ALL Qualifying starts at 11:05am, before Sunday’s 84-lap race gets underway at 2:05pm.